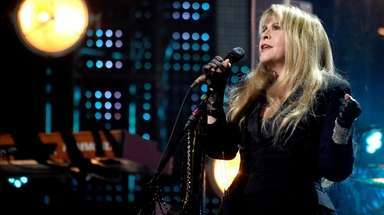 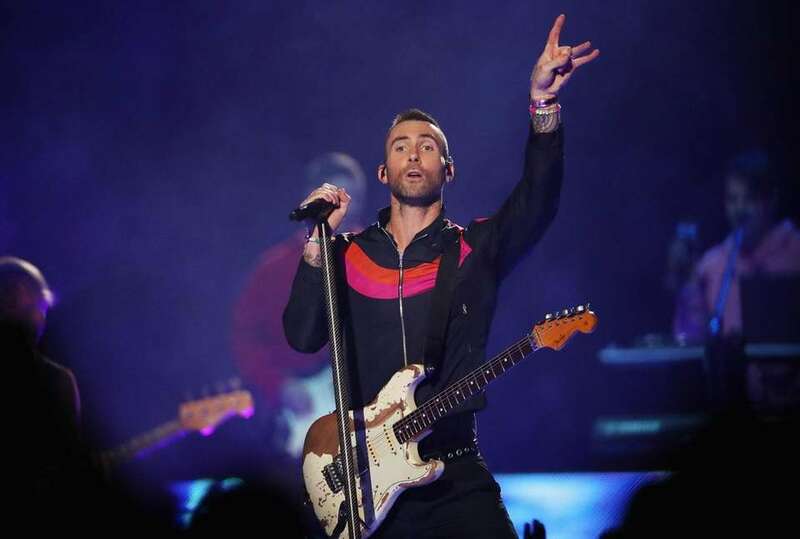 See Maroon 5, Travis Scott and Big Boi (of OutKast) perform during the Super Bowl LIII halftime show on Sunday, Feb. 3, 2019, at the Mercedes-Benz Stadium in Atlanta, during the game between the New England Patriots and Los Angeles Rams. 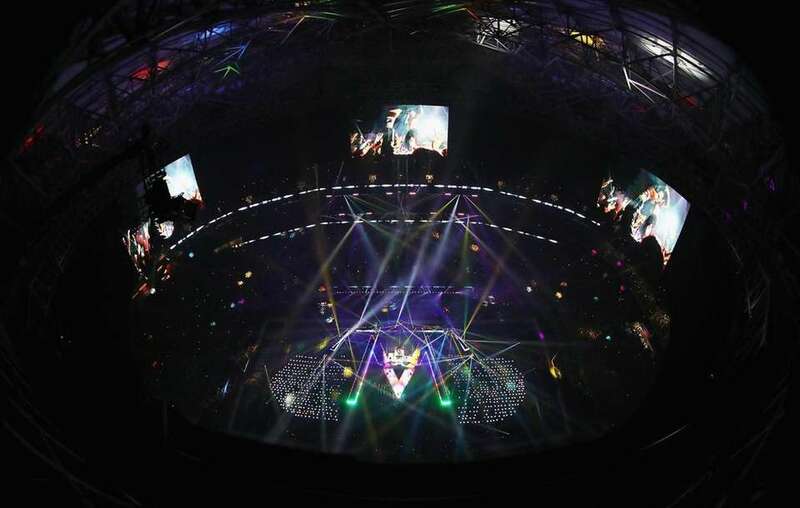 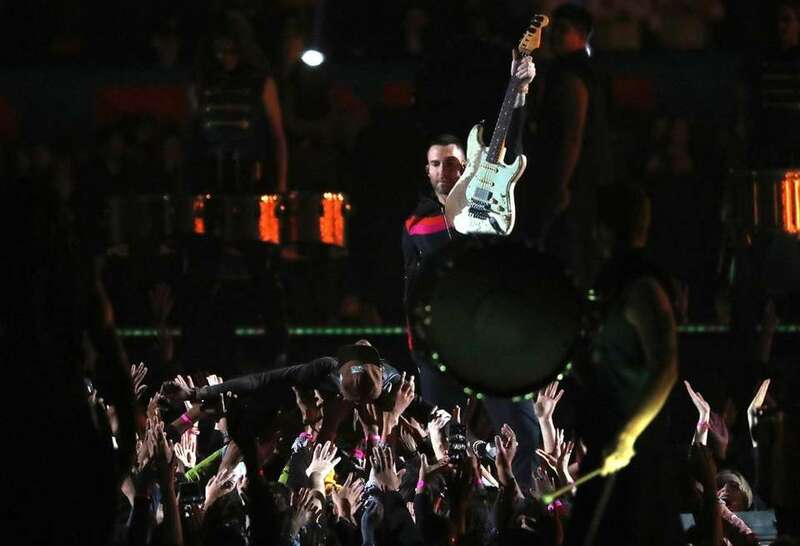 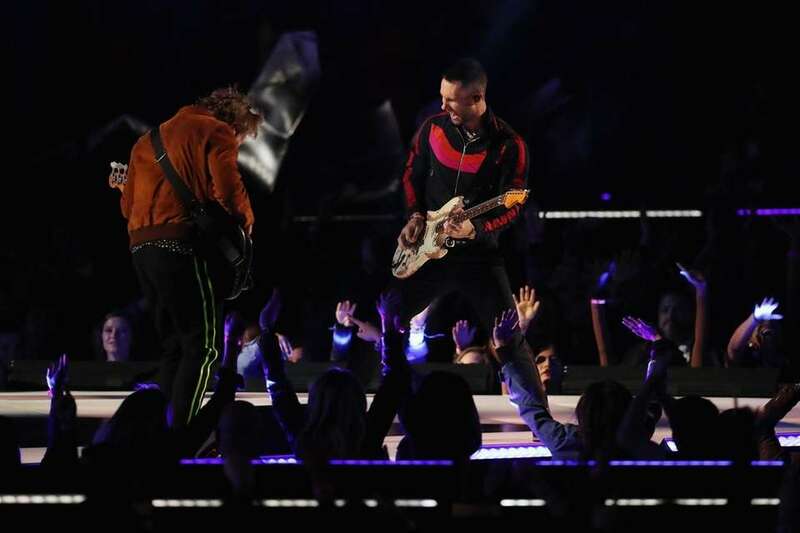 Maroon 5 performs during the Pepsi Super Bowl LIII Halftime Show. 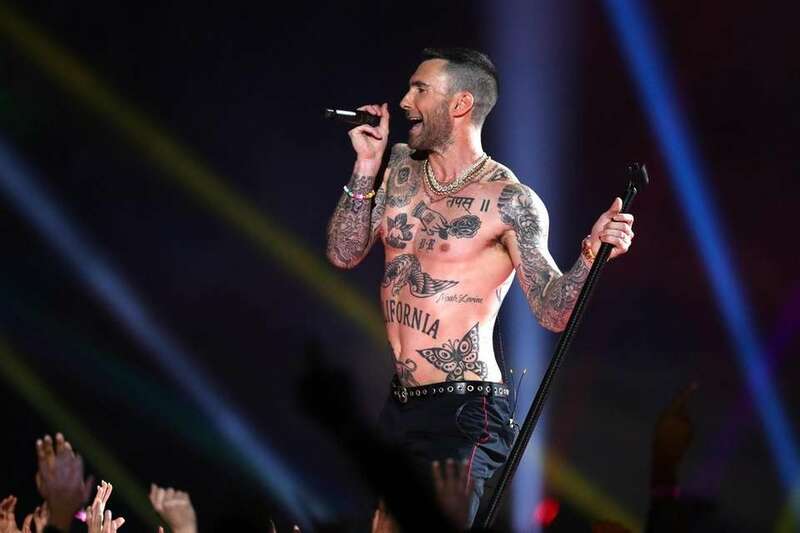 Maroon 5 lead singer Adam Levine performs during halftime. 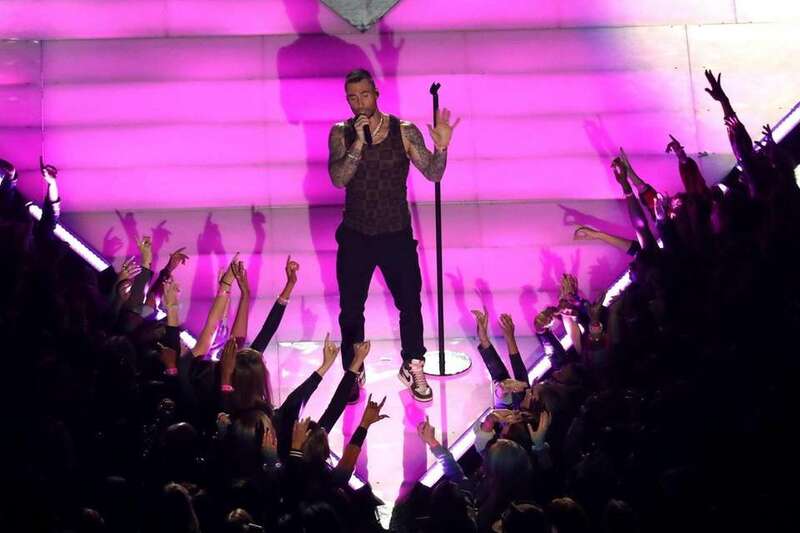 Adam Levine and Maroon 5 perform during the halftime show. 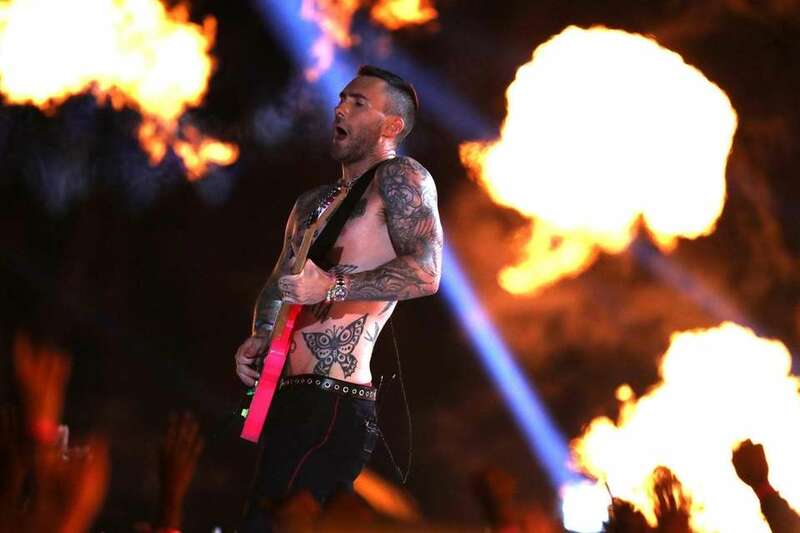 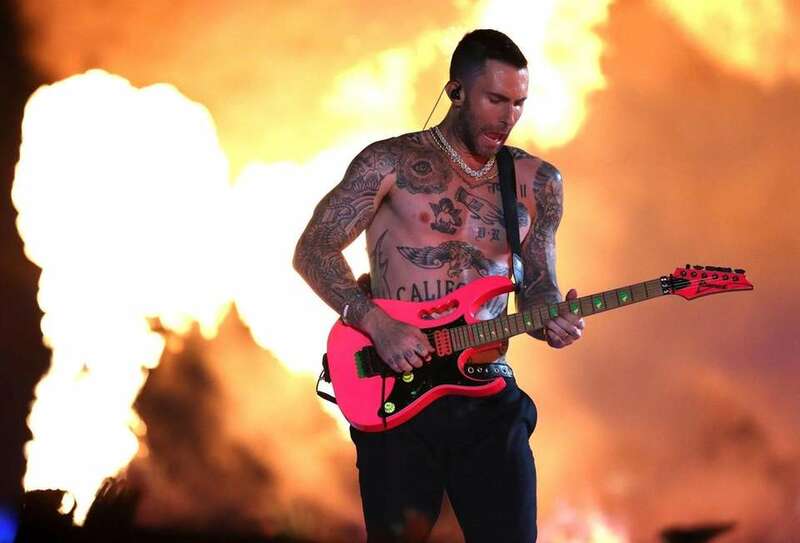 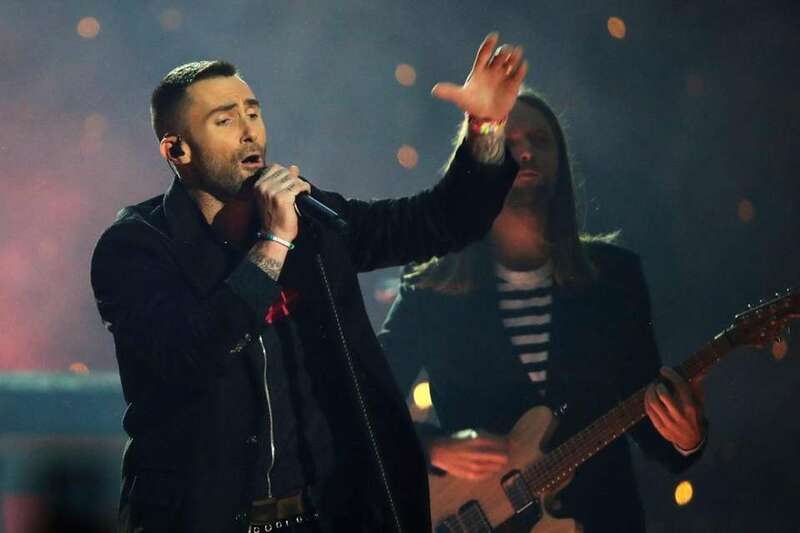 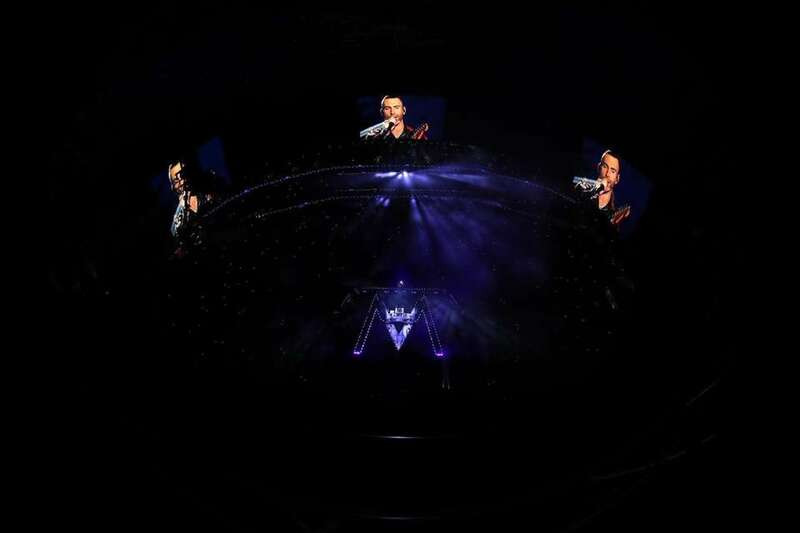 Maroon 5 frontman Adam Levine performs during the Super Bowl LIII halftime show. 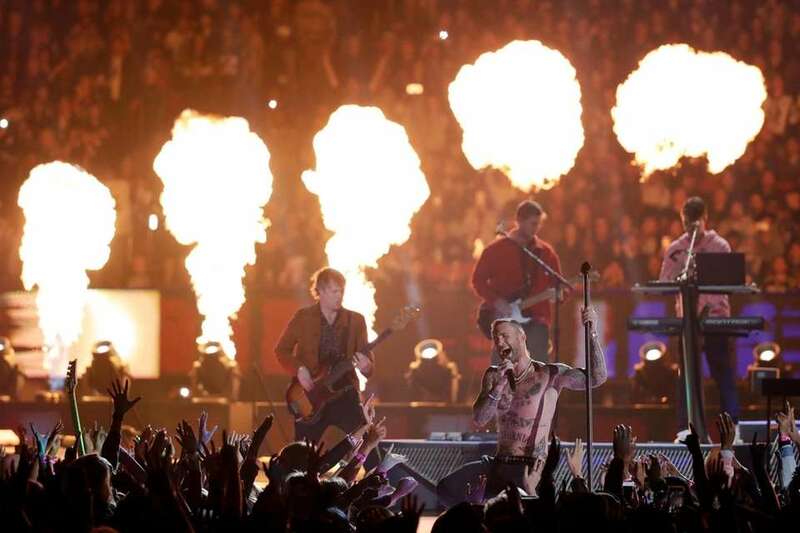 Maroon 5 performs during the Super Bowl halftime show. 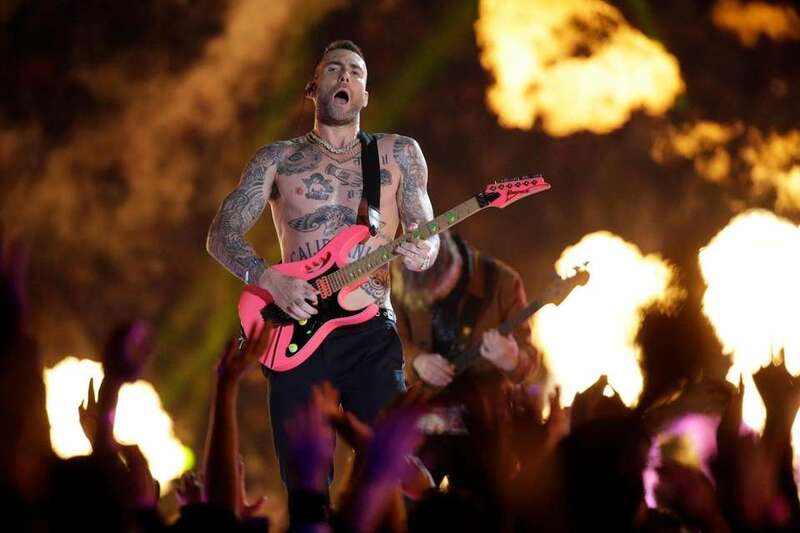 Adam Levine of Maroon 5 performs during the halftime show. 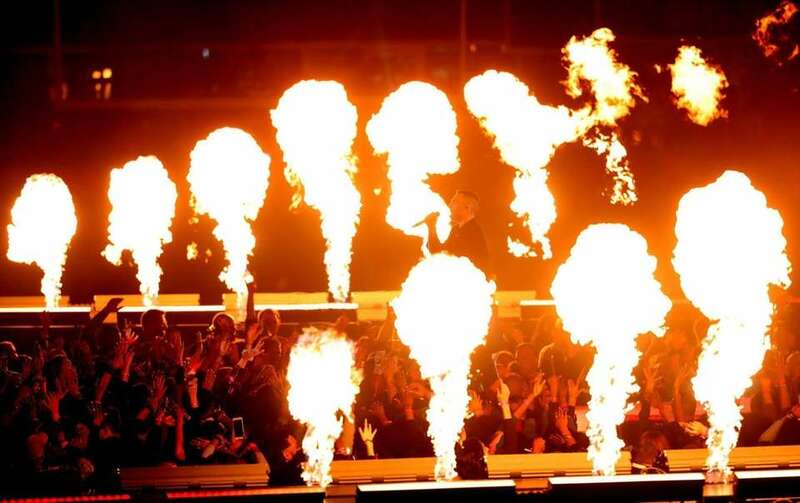 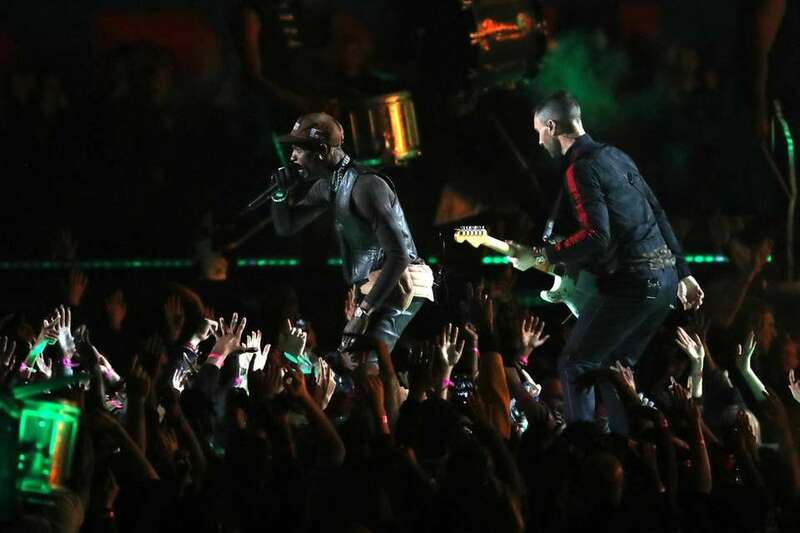 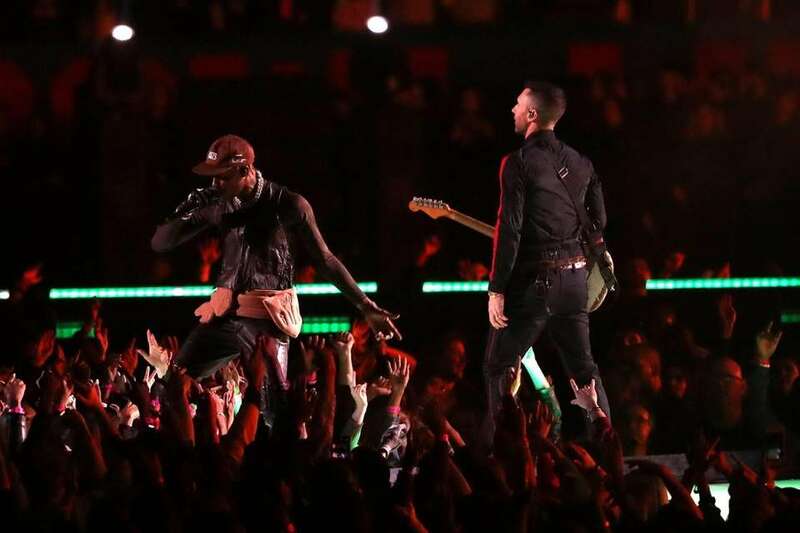 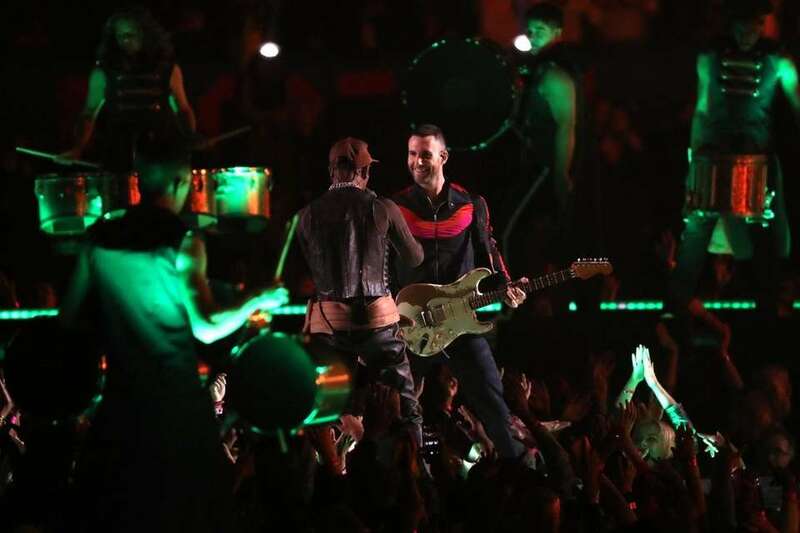 Travis Scott, right, performs with Adam Levine and Maroon 5 during the halftime show. 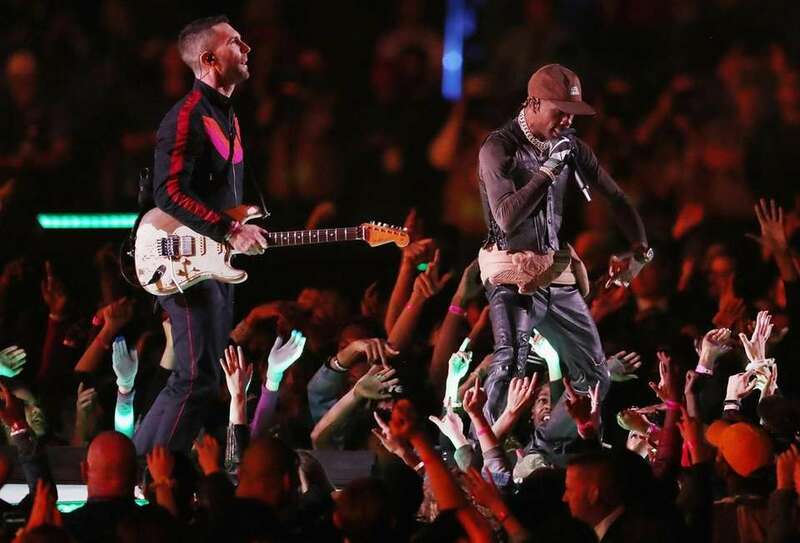 Travis Scott, left, and Adam Levine of Maroon 5 perform during the halftime show. 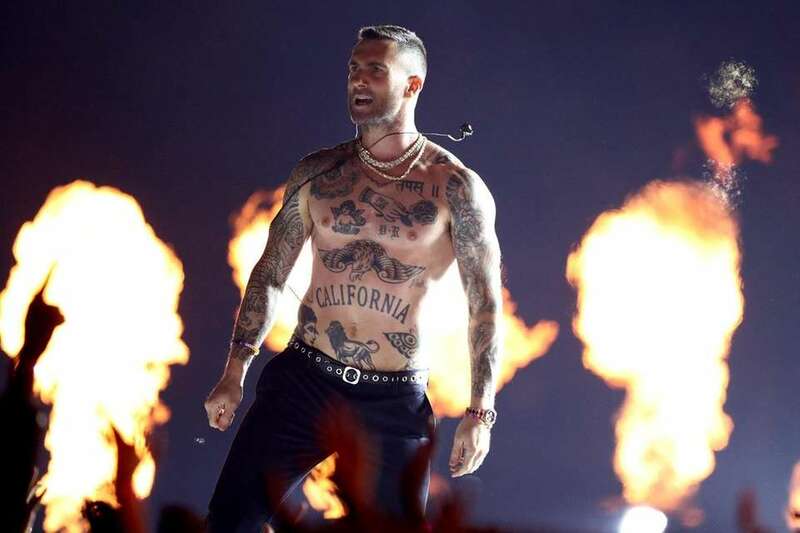 Adam Levine of Maroon 5, left, and Travis Scott perform during halftime. 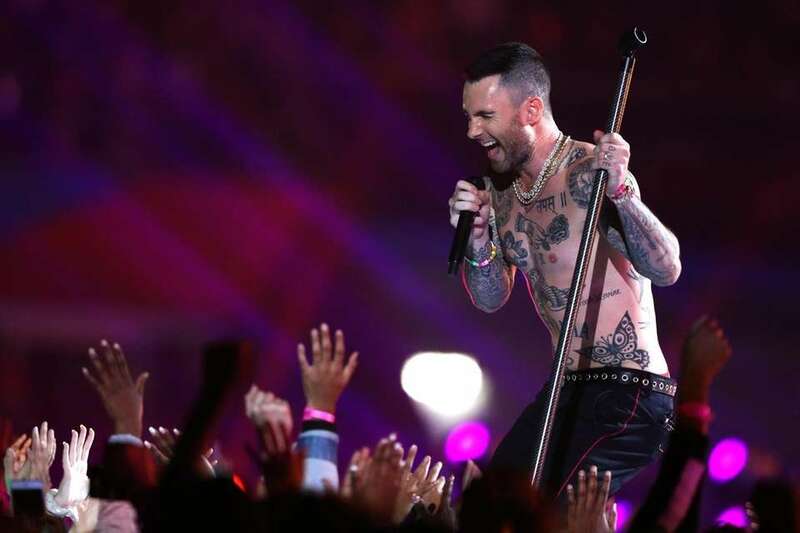 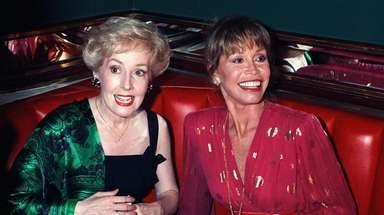 Adam Levine of Maroon 5, left, and Travis Scott perform during the halftime show. 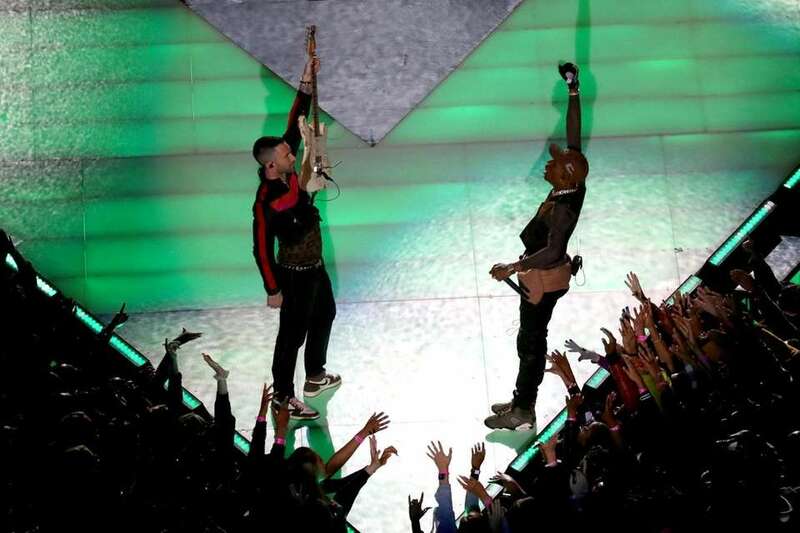 Travis Scott and Adam Levine of Maroon 5 perform during the halftime show. 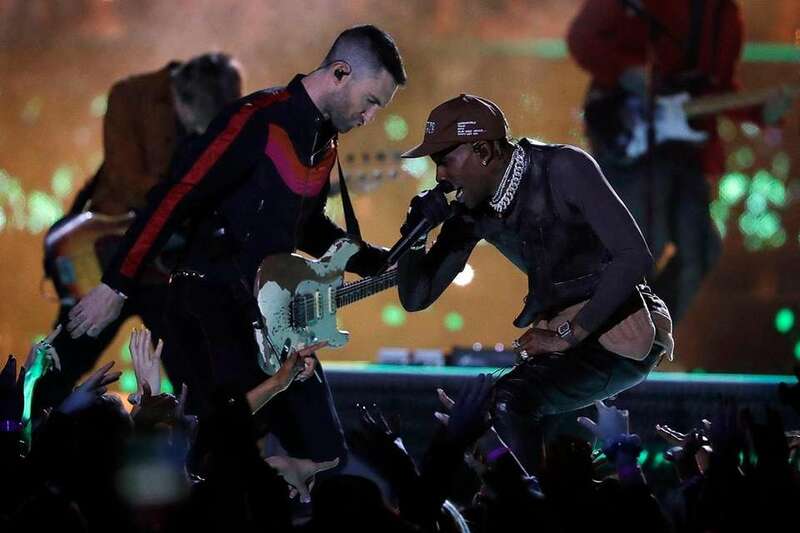 Travis Scott and Adam Levine of Maroon 5 perform during the Pepsi Super Bowl LIII Halftime Show. 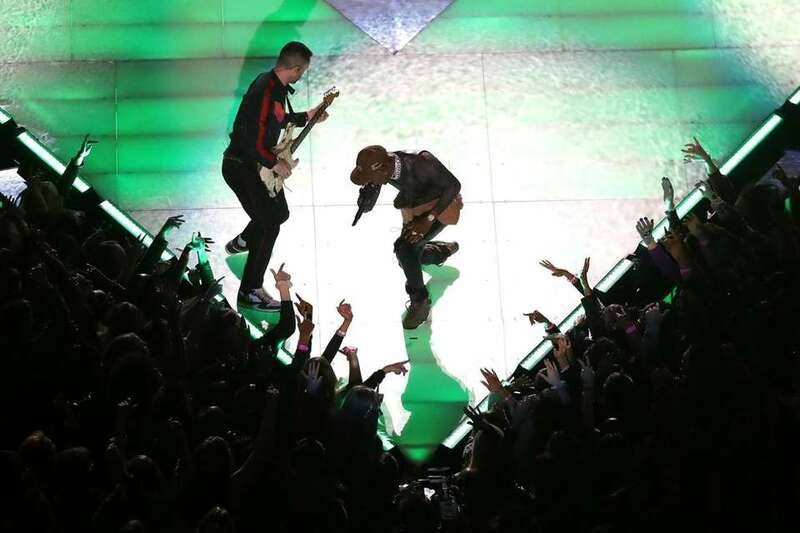 Travis Scott crowd surfs as he performs with Maroon 5 during the Pepsi Super Bowl LIII Halftime Show. 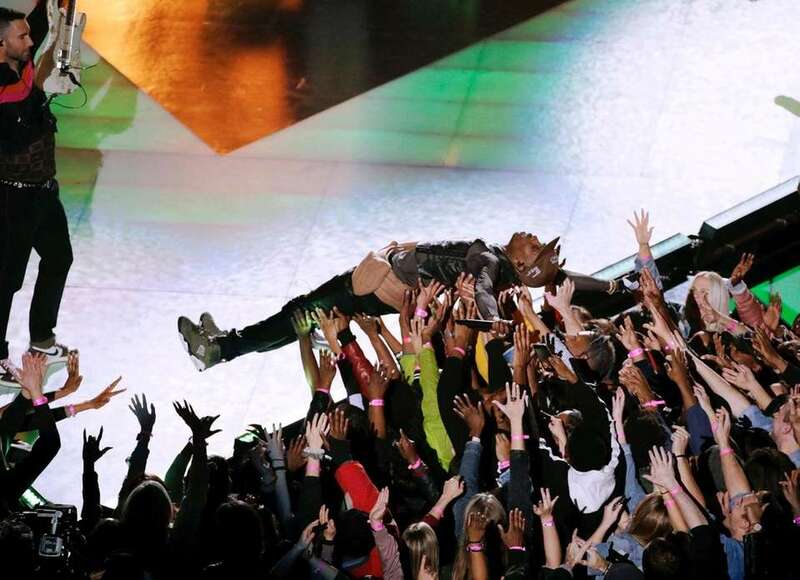 Travis Scott of Maroon 5 crowd surfs during the halftime show. 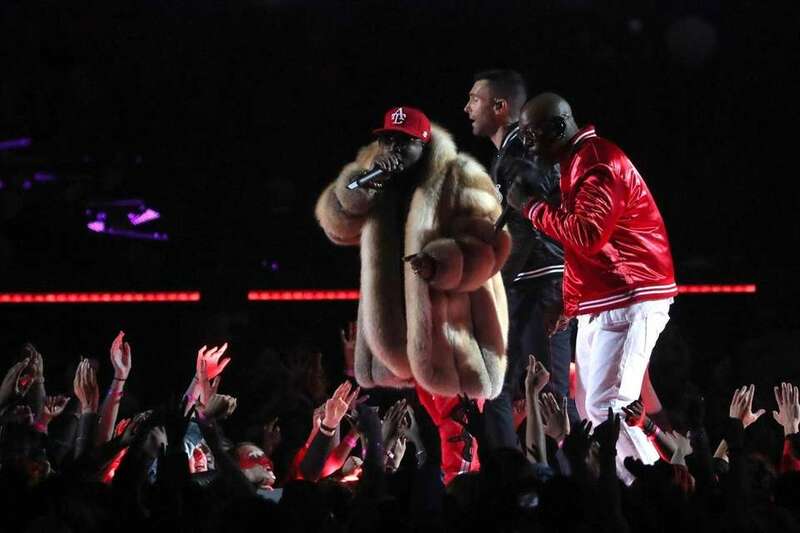 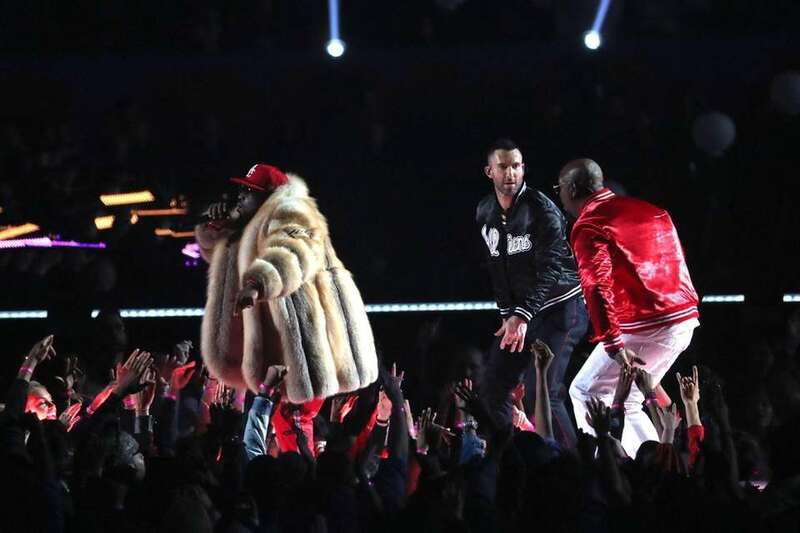 Big Boi, left, Adam Levine of Maroon 5 and Sleepy Brown perform during the halftime show. 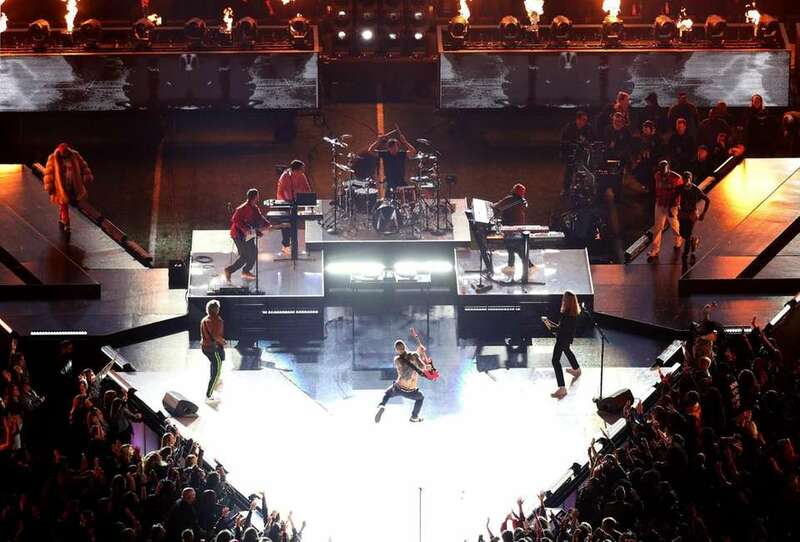 Maroon 5 performs with Big Boi, Sleepy Brown and Travis Scott during the halftime show. 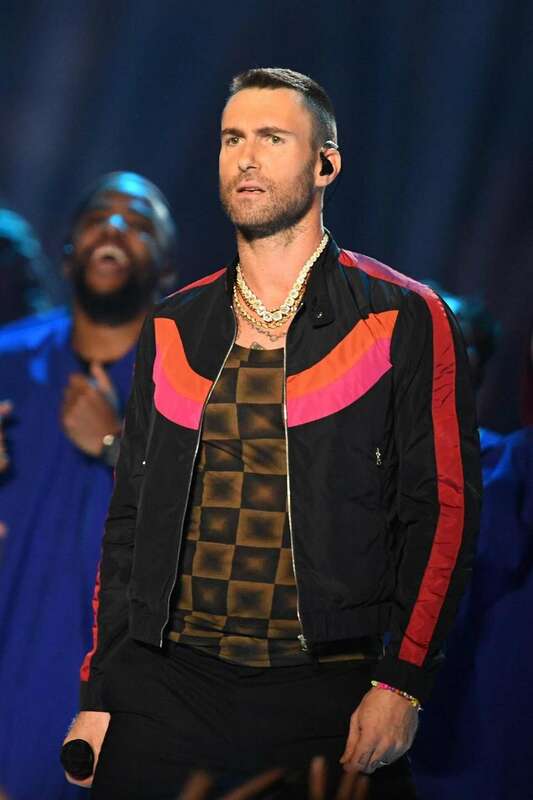 Adam Levine of Maroon 5 performs during the Super Bowl LIII Halftime Show.